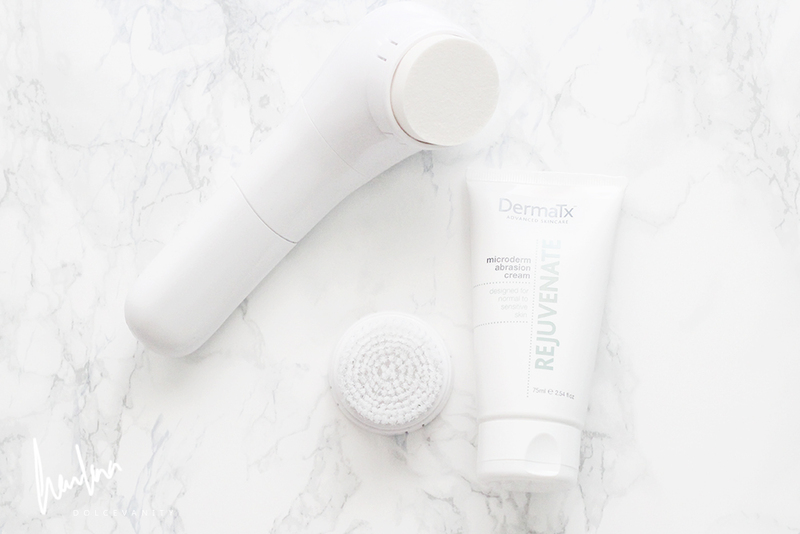 I've trialled a few skin devices and today I'm going to start to add this at home Microdermabrasion Rejuvenate System from DermaTx. The Rejuvenate cream is designed for normal to sensitive skin types. I'm going to see how my skin looks within 2 weeks and then after a month using this twice a week after cleansing at night giving the skin a chance to heal during the night as my body rests. It's the physically exfoliation of the top layer of the skin, giving us smoother and younger looking skin. Helping to smooth out wrinkles, shrink pores and to also get rid of pigmentation. The crystal in the cream buff away the top layer of the skin using the microdermabrasion sponge. DermaTx treatment creams contain the same professional grade corundum crystals that are used in clinics to perform this procedure. If you are wondering the difference between microdermabrasion and regular exfoliation is that the microdermabrasion uses smaller grains that are also stronger than your regular exfoliation. Alumina, Aqua (Water), Paraffinum Liquidum (Mineral Oil), Glyceryl Stearate SE, Caprylic/Capric Triglyceride, PEG-8, Saccharide Isomerate, Sodium Ascorbyl Phosphate, Phenoxyethanol, Cera Alba (Beeswax), Stearyl Alcohol, Cetyl Alcohol, Tocopheryl Acetate, Xanthan Gum, Magnesium Aluminum Silicate, Lactic Acid, Ethylhexylglycerin, Sodium Lauryl Sulfate, BHT, Citric Acid, Laminaria Ochroleuca Extract, Sodium Citrate, Maltodextrin, Beta Glucan, CI 77891. I'd love to know if you've tried an at home microdermabrasion or had it done professionally? If not is this something you'd consider?